It didn't happen all at once, I saw the smoulders coming out, and slowly, steadiely it burned down to ashes turning it all black by the hate, terrorism and the list is endless. Black.Dark.Gloomy.Hellish. Terrified of what the world had become, I wake up with a jerk. Fortunately​, It was a dream I time travelled in. Just stop and look around and ask yourself, Is this the world you want to live in? Absence of Colors ? Colors of love, peace, positivity and kindness. Don't let the picture of future reflect river Styx. Color every niche. Let the good win over all the evil which is why the festival of Colors, holi is famous for. So let love live, let peace play, positivity perceive and kindness kindle. let Colors be the new black. Namaslay everyone!🙏How you doing? 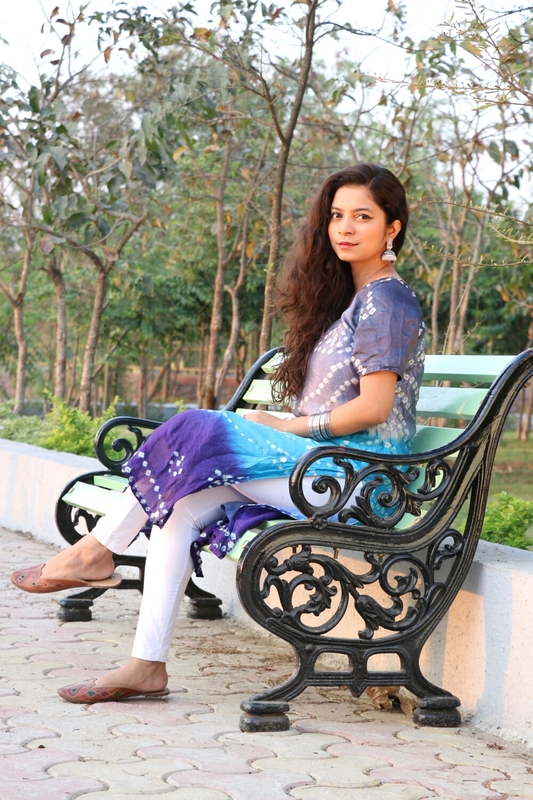 This holi, letting the blue take away my blues with this traditional look. 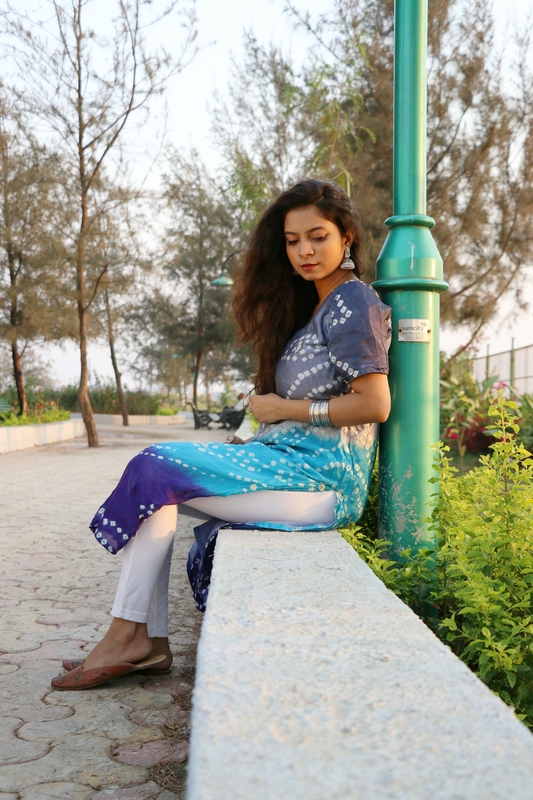 My tailor like a magician transformed​ an ombre pattern, popular, printed indian fabric named Bandhani into this kurta. It's a long kurta since I wanted it to have a hint of Pakistani style. 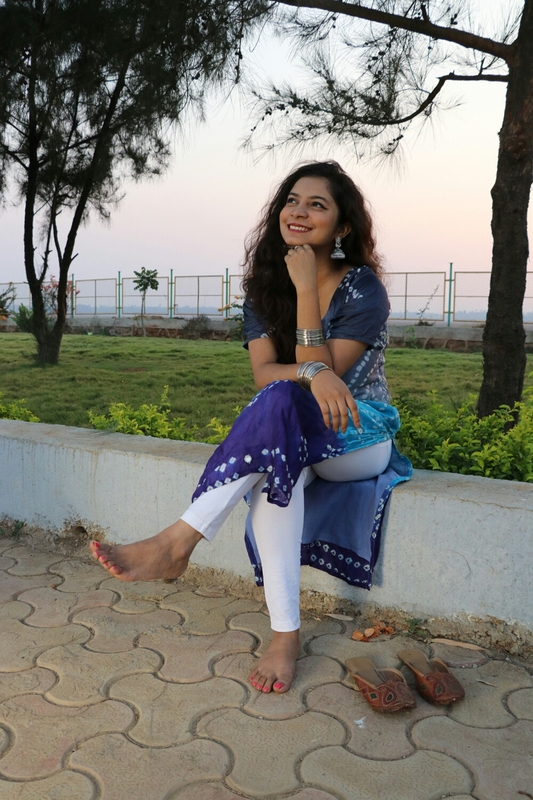 Teamed the bandhani kurta with a white legging which is a very peculiar indian style. Can you please just stop and look at those silver pearl piece of gorgeousness? 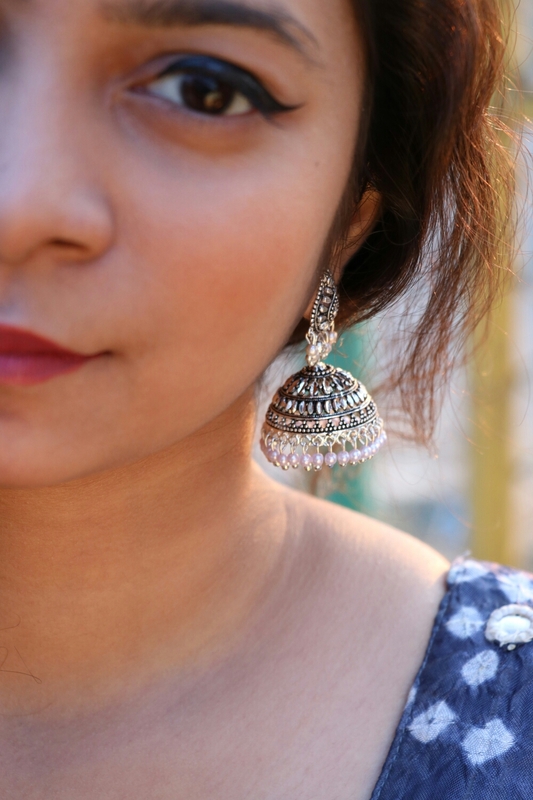 Coming to my favourite part of the whole look, Jhumkhas. I absolutely love indian silver/ oxidised boho accessories. When I first saw them I knew I have to have these. They are from a local shop for 150 bucks or so. They have such intricate design that makes it look all nice and delicate. 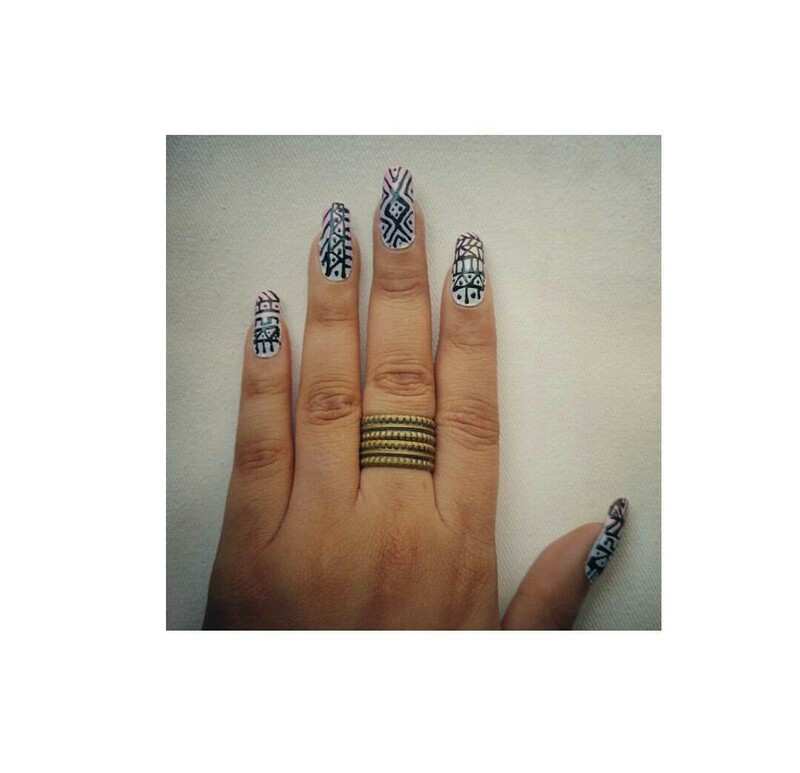 Added silver bangles to both my hands and I was done with accessories. When it comes to traditional, juttis are the best. Picked up this tan juttis from a thela outside Jogeshwari station. The bhaiya was selling them for 100 or so I don't remember. Just a tip paint your nails before you go out to play with Colors, that will prevent your nails from getting stained. 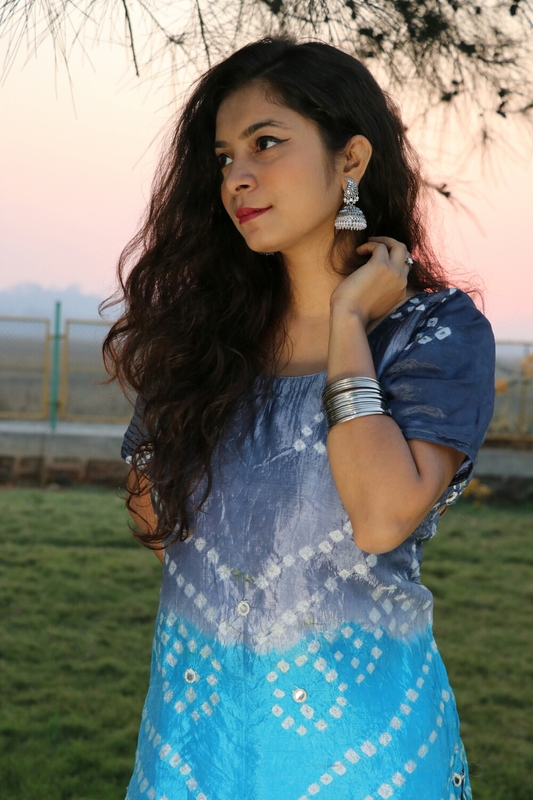 Since tribal happens to be my favourite, I went ahead with it having an ombre base of faded blue and purple, trying to match my kurta but failing terribly! One can carry this look for choti holi or a holi party. You can go head with it even when you want to go traditional or for a lighter functions where you don't wanna go overboard​! So that's how I crafted my holi look. Twist the look your way and tag me. Share your holi #OOTD. Let's spread girl love and inspire each other. Happy holi to all you lovely people!🌈 Spread the Colors of love, peace, positivity and kindness.💙💚💛💜 Play safe, save water. Stay tuned for my next one. Till then stay bomb and keep slaying! More hope, love and positivity to you, The Bay Bomb, Sonia Patel.